Denham Springs School Board Member Buddy Mincey, Jr., was elected president of the Livingston Parish School Board on Thursday (Jan. 10) by his fellow board members. David “Bo” Graham of Walker was elected board vice president. The vote was the first official act of business taken by the newly sworn-in board, which includes four new members: Brad Sharp of Livingston, District 1; Bradley Harris of Denham Springs, District 4; Frank Parrino of Springfield, District 8, and Devin Gregoire of Albany, District 9. Those returning members include Kellee Hennessy-Dickerson of Watson, District 2; Jan Benton of Denham Springs, District 3; Buddy Mincey, Jr., of Denham Springs, District 5; Jeff Cox of Walker, District 6; and David “Bo” Graham of Walker, District 7; all of whom received no opposition for re-election to their seats. 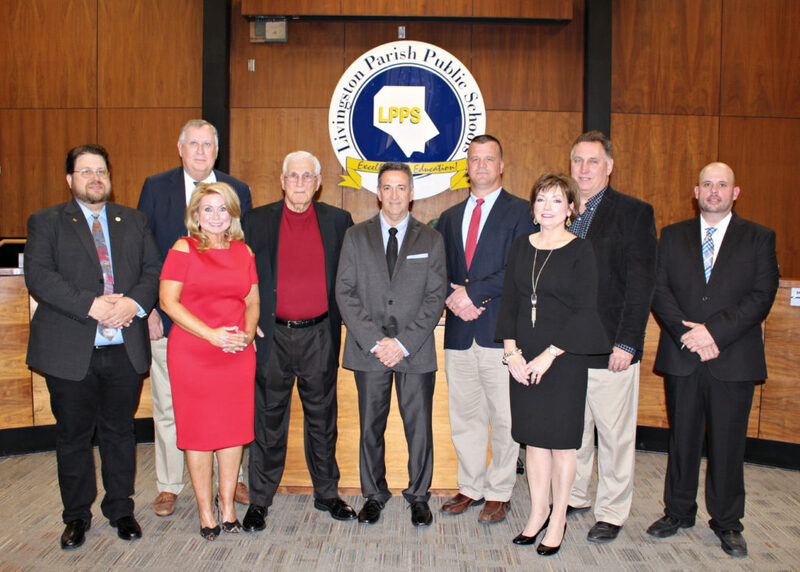 The newly elected Livingston Parish School Board includes, from left to right, Devin Gregoire of Albany, David “Bo” Graham of Walker, Kellee Hennessy-Dickerson of Watson, Frank Parrino of Springfield, Jeff Cox of Walker, Buddy Mincey, Jr., of Denham Springs, Jan Benton of Denham Springs, Bradley Harris of Denham Springs, and Brad Sharp of Livingston. Demolition crews have received clearance to begin tearing down the old Denham Springs Elementary, Southside Elementary and Southside Junior High Schools that were severely damaged by the 2016 flood. Assistant Superintendent Joe Murphy said the demolition of Denham Springs Elementary and Southside Junior High is being managed by Gremillion Industrial Services, while Insulation Technologies, Inc., received the contract to tear down Southside Elementary. As part of these companies’ low bids, they have the option to salvage some of the schools’ buildings materials – including two-by-fours, screws, nails and metal – and resale these items. Murphy said the cost for demolishing the three campuses is more than $650,000. FEMA and the U.S. Department of Housing and Urban Development are paying 90 percent of the demolition costs, with the school system paying the remaining 10 percent, he said. Demolition of all three campuses is expected to be completed by the end of February. 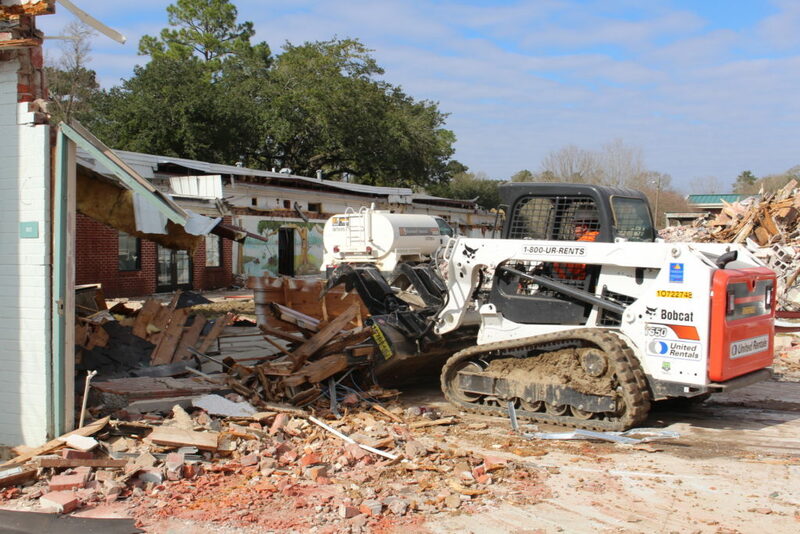 An equipment operator uses a Bobcat skid-steer loader to pick up debris from the demolition of Denham Springs Elementary. 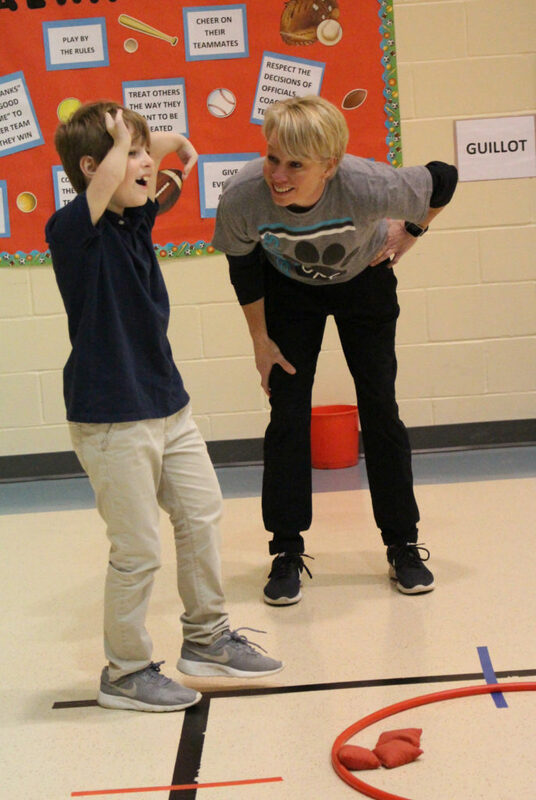 Juban Parc Elementary Student Carson Tullier expresses his excitement as he is greeted by Adapted Physical Education Instructor Lisa Dugas during the surprise announcement celebration that Tullier was named a winner of the Louisiana Council for Exceptional Children’s “Yes I Can” Award in the category of self-advocacy. Four Livingston Parish students have been awarded this year’s “Yes I Can” Awards by Louisiana’s Council for Exceptional Children, making each of them eligible for the organization’s national awards program. The “Yes I Can” Awards recognize children and youth with exceptionalities who have demonstrated their determination and achievement in multiple ways. The “Yes I Can” Awards review committee selects one winner each year in each of the following categories: academics, arts, school and community activities, self-advocacy, technology and transition. The parish’s four winners include Alisha Davis, a 5th grader at South Fork Elementary, who won in the art category; Timothy Bell, a 4th grader at Freshwater Elementary, who won in the academic category; Heaven Barker, a 3rd grader at Freshwater Elementary, who won in the technology category; and Carson Tullier, a 3rd grader at Juban Parc Elementary, who won in the self-advocacy category. More than 20 teachers from 12 schools across the parish recently gathered at the Livingston Parish Public Schools’ Central Office for more than two hours on a January afternoon to learn how to customize for their students the many learning activities and games that are available on the STEAM Express. The STEAM Express is a school bus that has been converted into a mobile classroom that is equipped with Wi-Fi, touch-screen monitors and laptops, and hands-on, interactive modules that are designed to help students creatively learn concepts in a variety of subject areas. The flexible design allows educators to easily transition the bus set up from elementary-level activities to high school-level projects. Lavergne said at least one person from each school must be fully trained in how to set up the equipment, how to program it and use it, and how to manage the learning time among the various activities, before that school can schedule the STEAM Express for a visit. 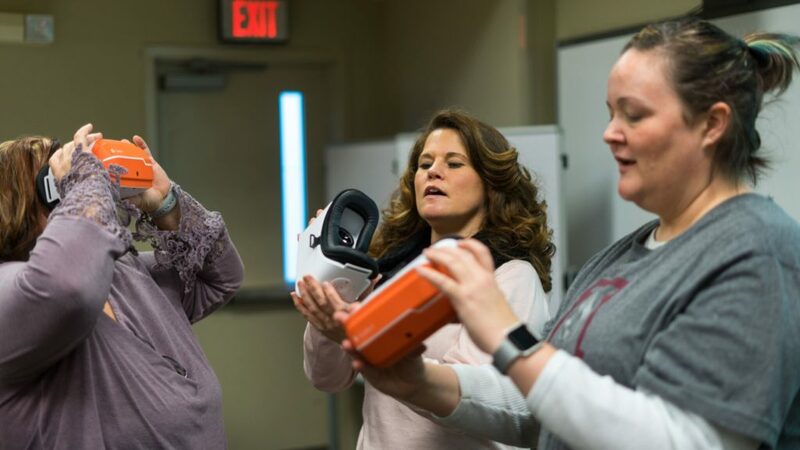 Albany Middle School teachers Missy Dickerson, Donna Badon and Angela Baronet, learn how to operate virtual reality glasses that are available on the STEAM Express during a workshop at the central office.